Walt Disney Concert Hall in Los Angeles, designed by Frank Gehry. When I first saw the towering curved steel walls of the Walt Disney Concert Hall in Los Angeles, they looked like sails coming at me. My first response was WOW this is different from anything I've seen before. I'm a real fan of modern architecture and it takes something really different to surprise me anymore. The curving steel walls and contrasting shades of color were eye boggling. 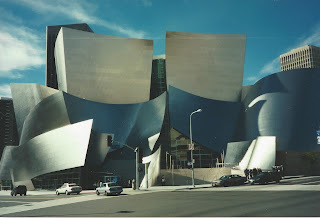 The architect was Frank Gehry, who has been labeled by Vanity Fair as the most important architect of our age with a number of his attractions like the Guggenheim Museum in Bilbao, Spain, The Experience Music Project in Seattle, and Walt Disney Concert Hall being world-renowned attractions. As we walked around the building, we arrived at a large garden with flowers and trees that seemed be a nice place to visit during the intermissions in the performances. A center piece is a large rose shaped fountain designed in honor of Lillian Disney, Walt's wife who made the original $50 million donation in 1988 to build the hall. 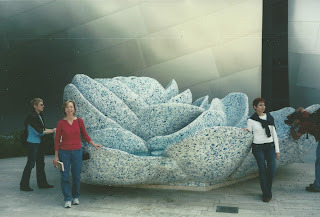 She loved Royal Delft porcelain so the fountain is covered in broken pieces of Delft porcelain. The inside is also breathtaking with large curved open spaces for a variety of activities including a Children's Amphitheater. Gehry's use of wood was influenced by his interest in the work of Frank Lloyd Wright. He made a point of not meeting Wright in person because of his master-slave relationship with his workers. The main hall seats 2,265 people. We did not attend any performances, but we understand the acoustics are excellent having been designed by Minoru Nagata. The large underground garage holds 2000 cars on seven levels. The garage alone cost $110 million. Construction was stopped for a number of years to raise the money to continue building it. When it was finally completed in 2003, it had cost a total of $274 million. Twenty-five architects were asked to submit plans. Gehry was surprised when he won, but he was aware that there was resistance to building it according to his plans, and he needed the backing of the Disney family to insure that he got to do the actual oversight of the construction. The use of new materials led to some unexpected consequences-- dangerous glare. The curved steel walls caused the focusing of heat on nearby buildings making them overheated, shooting up their air conditioning costs. After complaints Gehry came up with a way of sanding the surfaces to reduce the glare. When I decided to do this story, I read a biography on him, "Conversations with Frank Gehry" by Barbara Isenberg. He was born Frank Owen Goldberg in Toronto, Canada, in 1929. Because of prejudice and bullying directed at Jews, he changed his name to Gehry when he became an adult. It was a struggle to find his potential as an architect and he met much resistance because of his outside of the box ideas. After his stint in the army he went to the Harvard Graduate School of Design. He lasted one year, but because he had paid for a two year program Harvard allowed him to sit in on whatever classes in the rest of the University that attracted him. This was a good year for him as a broadening experience. Years later Harvard gave him an honorary degree. He moved back to Los Angeles in 1962 and began his own practice. Everything he did seems different from his last project. One that brings a smile every time I look at is the Nationale-Nederlanden Building in Prague, Czech Republic. It looks like a slightly off balance women with too tight a girdle standing next to a straight standing man. Gehry actually based it on a dancing scene of Fred Astaire and Ginger Rogers. Art museums and concert halls seem to be the main benefactors of new uses of building materials and stately designs. Examples of outstanding modern building in Missouri include Bloch Building at the Nelson-Atkins and the Kauffman Center for the Performing Arts, in Kansas City, and the Pulitzer Arts Foundation in St. Louis. Here in Columbia we can take pride in the Daniel Boone regional Library and the Firestone Baars Chapel at Stephen College. My daughter stands beside a large rose shaped fountain designed in honor of Lillian Disney, Walt's wife.